Lou Brown's life is going down the pan. Best friend Hannah sailed through the Olympic time trials and is off to her fancy pants new swim training school, while Lou's own failure to qualify leaves her without a hobby, or a friend. 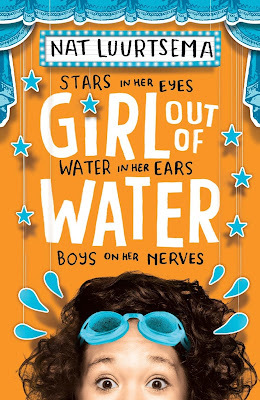 As Lou tries to navigate her post swim world, a chance encounter with three boys with stars in their eyes takes her life in a surprising new direction. One that leads to a crazy world of underwater somersaults, talent show auditions, bitchy girls and one great big load of awkward boy chat. Swimming has been all fifteen year old Lou Brown has ever known since the tender age of four years old, but her olympic aspirations have just been dealt a severe blow. While her best friend Hannah is about to depart for the Performance Training Camp, Lou is left behind to contemplate what may have been, coming last in her heat. Lou and Hannah have always had one another, so now Lou is determined to make new friends. But when she's recruited to train a new swim team, she may have gotten more than she bargained for. Pete, Roman and his younger brother Gabriel devise a plan to enter Britain's Hidden Talent, recruiting Lou to choreograph their underwater routine. 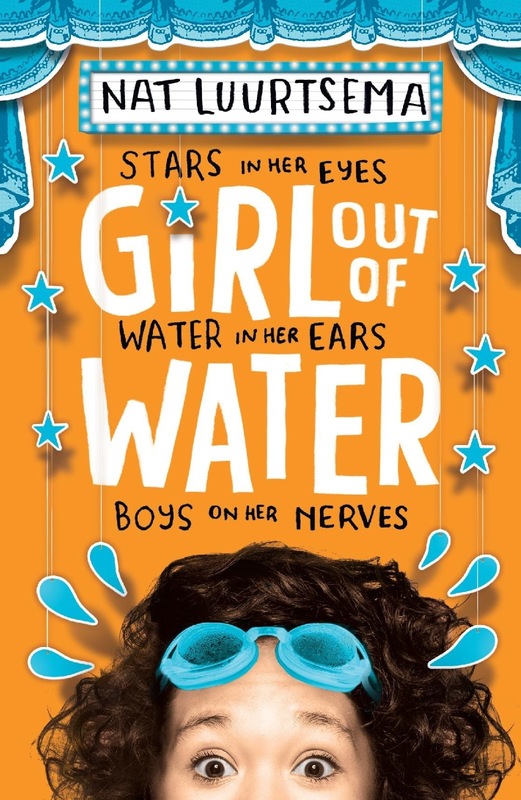 While Lou begins to learn to live without competitive swimming, she realises that she's uniquely Lou and it's time to sink or swim. Girl Out Of Water was an absolute delight. Following the storyline of Lou, awkward, lumbering and clumsy. As she treads water, Lou is a vision of grace but after coming in last to qualify for the Performance Training Camp, she now faces the prospect of life beyond the water. Lou is by far one of my favourite fictional characters, she's intelligent, hilarious and incredibly entertaining. Her inner monologue often refers to how awkward she feels as a young woman with an athletic body, she's not particularly self conscious, but aware that she's towering and muscular. But Lou also uses humour in awkward situations, which only endeared me to her character further. It's fine. If I ever get a boyfriend, I can carry him around when he's tired. She wobbles away on her monstrous shoes. She looks like a baby gazelle. I can't imagine how dumb I look when I clump along behind her. Gazelle and the mammoth, off on their adventures. With older sister Laverne, the Brown household is an usual family situation. After losing his job, her father has moved back into the family home, while her mother is experimenting with dating often with disastrous results. In what is an unusual role reversal for young adult novels, it's their father who is the homemaker, while her mother's specialty dish is food poisoning. Lou's parents are incredibly supportive, they understand her devastation but encourage the fifteen year old to spread her wings and concentrate on her studies. The only problem Lou faces now is a life without swimming and discovering who she is without best friend Hannah, a girl who Lou has always been content to stand in her shadow. Pete, Roman and Gabe have been practicing as an amateur dance troupe, but having already filled their quota, are refused entry into the Britain's Hidden Talent competition and need to find a niche to enter with a new routine and employ Lou's assistance. It was incredibly charming, not to mention laugh out loud funny. It also touched on series issues such as realistic body image and the pressure teens face often from parental influences. While Lou's family is incredibly supportive, her best friend Hannah is the daughter of two parents who push the young teen to her limits. She's spent, suffering from low self esteem and yet her voice isn't heard until another adult speaks for her. Between both Lou and Hannah's characters, teens will find a relatable medium they can champion. I absolutely loved it. Never a dull moment, Lou's character hooked me from he very first page and reduced me to big, honking, incredibly unattractive laughing. A brilliantly entertaining read and a feel great experience! I'm so glad we get the same review-books because YOU CAN BE THE GUINEA PIG AND IT'S VERY HANDY THANKS FOR THAT KELLY. XD Ahem. But anyway! I was planning on reading this probably this weekend, except I got distracted by library books so who knows what'll happen now. But I will read it eventually. I confess I thought it looked a bit too light and fluffy? But if it's laugh-out-loud hilarious then I'M ALL FOR IT. It is light and fluffy, but oh so funny. Lou is so sarcastic and even her dad has shades of snark. It's such a nice change from all the heavy themed contemporaries around lately. I wish we could claim this one Joy, but I think the author might be British. Still so wonderfully lovely and Lou is such a gorgeous character. I loved her immensely. It was glorious Lauren, one of the funniest books I've had the pleasure of reading so far. Sorry Sarah, but this is one I really insist on. It's light, fluffy and fun. Everything we all need lots more of in our lives, and reading. I'd love to see what you think of it though. I'd love to see what you think of it Sarah, such a wonderfully heartwarming read. I seen your review on Goodreads actually Shannon and knew you would have loved this book, being able to see yourself in Lou and her swimming. It was adorable. I think I prefer the US cover too. I like this edition, but it makes it look like a much younger read than it really is. It does suit the storyline though, being all cutesy. Oh your blog changed! Cute! I think you liked this a tad more than me but it was a perfect summer read. Light yet meaningful. I think I like this cover better than the one I have with the fish. It did ever so slightly. Thanks for noticing Karen. Going for a cleaner look that's mobile and tablet friendly. I started it at exactly the right time, needing something heartwarming and funny. Perfect for early to middle teens. I'm in two minds about the covers. I think a lot of readers might confuse this with the old covers on the Ladybirds series by Jenny McLaughlin. My book radar is completely off because I keep missing so many books. This one looks pretty fabulous and i'm glad you enjoyed it! I'll be on the look out! Me too Lily. I barely know of any new releases unless they show up in my letterbox. But I'm so glad this one did. So adorably funny and lovely. It is Kei, it totally is. And very cute too. I snorted with laughter throughout. I think most teens and women will see so much of themselves in Lou. I love protagonists with humour. I also glad to hear about supportive parents, it’s so rare in YA nowadays. I need this funny and charming story in my life. Your quotes have already lifted my mood. Thanks for putting it on my radar, Kelly. Wonderful review!